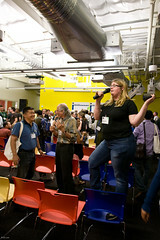 My previous post about Grace Hopper focused on all the cool ‘official’ conference activities, but the Teaching Open Source community members in attendance organized an informal lunch meetup to talk about all the great projects we’re working on at the intersection of Open Source and education. 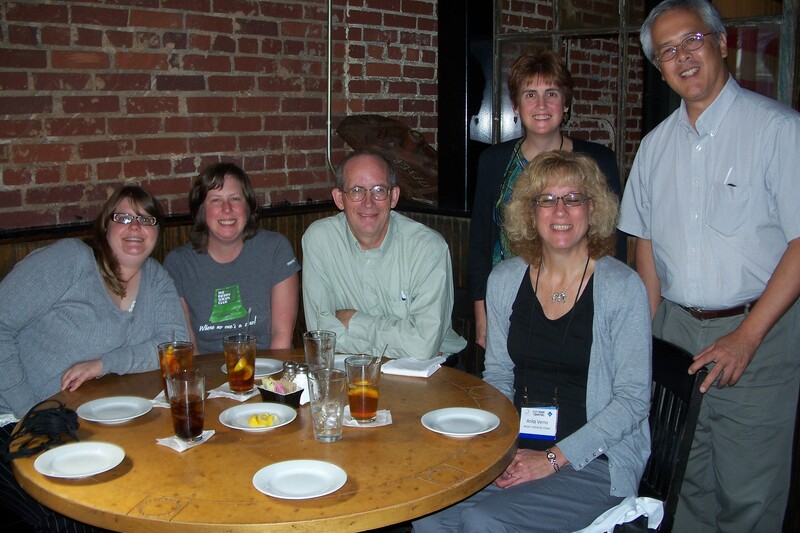 It was a wonderful opportunity to catch up with old friends, most of whom I know from the Humanitarian FOSS Symposium at SIGCSE 2009. Heidi Ellis and Greg Hislop treated us to an update on theXCite Group, their collaborative effort to generate, well, excitement around the discipline of Computer Science. One of its primary projects is SoftHum, a collection of materials for professors who’d like to teach open source through a focus on Humanitarian aims. Heidi has also composed a great write up of her experiences participating in the first ever Open Source Track at Grace Hopper, well worth a read. Deb Nicholson, Founder of the Women’s Caucus, gave us an update on the Caucus project to get more young women involved with Free Software. Mairin Duffy, Deb and other community volunteers have been working tirelessly on a eight week course to teach Inkscape, GIMP and other FOSS creative tools to members of the Girl Scouts of Eastern Massachusetts. The pilot program kicks off on October 15th, so look out for a full write up from Mairin on her blog around that time. Bill Madden treated us to news about the Bergen Community College HFOSS chapter’s summer project, Free Ambulance Services Technology (FAST). We talk a lot in the open source community about how projects start because of a developer’s need to ‘scratch her own itch,’ and FAST is a perfect demonstration of that adage. One of the Bergen chapter’s student developers works as an Emergency Medical Technician; his job requires lugging around a clipboard and paper form to document details for each patient served, all while simultaneously carrying a gurney and administering treatment. The HFOSS students created an Android based application that would allow EMT’s to enter all the data required on the paper form on a mobile device. Bill and his colleague, Anita Verno, will be hosting a conference in February at Bergen’s campus in Paramus, New Jersey, USA, focusing on open source technologies for use in secondary school education. We all had an enjoyable time enjoying great food and great company. Many thanks to RedHat for sponsoring our lunch meetup! This entry was posted in conferences, Teaching Open Source and tagged GHC10. Bookmark the permalink.